The Backcountry Camps in Austin Creek State Recreation Area are closed until further notice due to budget cuts. 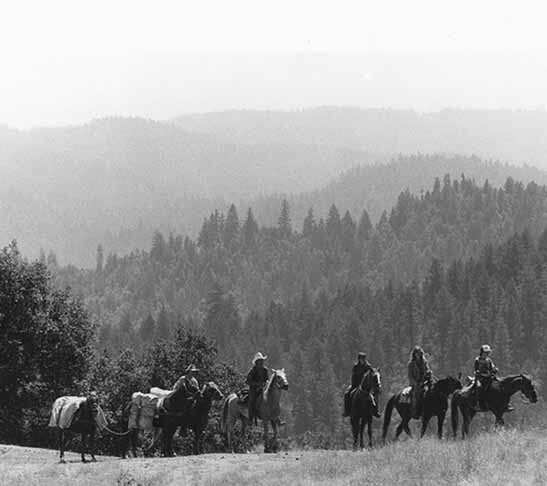 Dayrides OK.
Armstrong Redwoods State Reserve and the adjoining Austin Creek State Recreation Area offer the equestrian over 20 miles of trails exploring 6000 acres of deep cool redwoods, shady conifer and oak woodlands, sunny chaparral, open grasslands, and the riparian habitats of five streams. Elevations range from 120 feet above sea level to 2000' Coastal Mountain vistas. Trails are frequently steep, rugged and narrow with unsided bridges but nothing too treacherous for experienced trail horses and riders comfortable in mountainous terrain (except the abandoned and overgrown Gilliam Creek Trail). DAY RIDERS can pay the day-use fee and park their trailers by the Maintenance Yard behind the picnic area where trailheads connect to the East Ridge Trail or Pool Ridge Trail. Buy a map at the Entrance or Visitor Center so you don't get lost. Take the right fork after you enter the Park, do NOT attempt to drive a trailer to our Pack Station. A popular 6-mile loop uses the East Ridge Trail crossing over to the Pool Ridge Trail at the top of the connecting 1400' ridge. To the east of the open ridgetop meadow, a glade of trees hides a spring flowing into a horse trough hewn from a log, with pure drinking water suitable for refilling your canteen. More ambitious riders continue on a 14- or 20-mile loop past the trough, up McCray Mountain and past Bull Frog Pond Campground. Cross the road and continue on an unmarked trail to the fire road descending to Gilliam Creek. To the left of the bridge is a trail that connects to Gilliam Creek Trail back up the mountain, taking Pool Ridge Trail down the other side of the mountain to your trailer, completing a 14 mile loop. Or cross the bridge and continue along the creek, up Thompson Ridge to Tom King Camp or on to Austin Creek. A mile upstream are the two Mannings Flat Camps currently closed. For a very challenging ride where you may have to get off and lead your horse, the 20 mile loop crosses Austin Creek following a washed-out fire road downstream to Gilliam Creek Trail. Follow Gilliam Creek up an overgrown treacherous trail (the Park no longer maintains this trail and we no longer use it!) until it climbs back over the mountain picking up Pool Ridge Trail on the other side which returns to your trailer or our Pack Station. Although the streams are safe for horses, carry plenty of drinking water for there is no potable water in the backcountry. Pack lunch and prepare for changes in temperature and weather. HORSE CAMPING: These camps are currently closed. Camping in the Backcountry is no longer allowed. Disregard info below. The State Park allows horses only in the three primitive Tom King and Mannings Flat Backcountry Campsites, 8 to 10 miles from the trailhead. Backcountry permits required, available on a first-come basis. Park behind the Picnic Area by the Maintenance Yard after acquiring your permit at the Ranger Station between 8am and 4pm summers or phone for ranger schedule off-season. Both camps have adequate creek water for horses but must be purified for humans. Except for Spring, feed is marginal and requires supplements. No corrals, and the hitching rails are inadequate. Horses must be hobbled to graze and take rope for overhead picket lines. Each campsite has a pit toilet, picnic table with critter cupboard, and fire ring but no ground fires allowed all summer until the rainy season, so take a camp stove. No fishing or hunting. For more information, phone Laura & Jonathan Ayers, ranch and pack station owners, in the evening at (707) 887-2939.